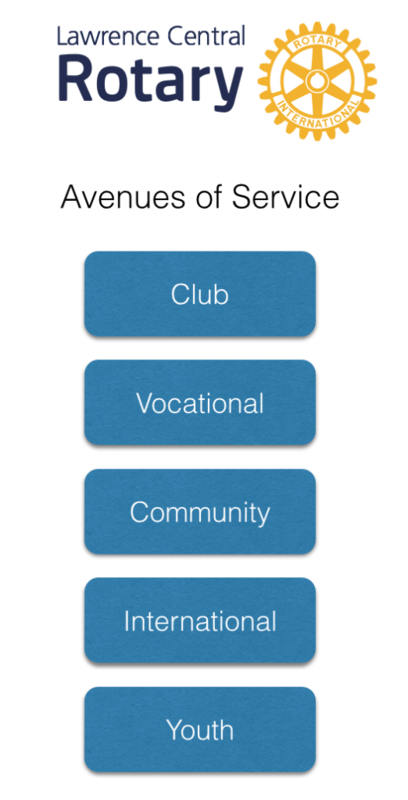 Lawrence Central Rotary channels our commitment to service at home and abroad through Rotary’s “Five Avenues of Service”, which are the foundation of club activity. Lawrence Central is a small club with close ties. We strive to be diverse and tend to skew younger than some of the other clubs in town. To that end our service tends to be very hands-on. Members make themselves available to team-solve challenges to the community and world beyond. We now host a Community Bike Ride twice a year to promote healthy living and give people a chance to safely explore bicycling. We provide free helmets and fittings to kids, maintenance on site and safe riding instruction. Through efforts of club members we have set up Ride Lawrence to be a resource for local people on bicycling options in Lawrence & Douglas county. We also do a wide range of help for local groups like The Willow, Salvation Army, and other groups in the area. Lawrence Central has rallied around Rotary’s Shelter Box program and meeting and working with other projects as our budget allows. For several years Lawrence Central works with the Sister Cities program who’s goal is to “Promote peace through mutual respect, understanding and cooperation — one individual, one community at a time.” Lawrence Central works to fund scholarships to the students who travel abroad each summer as our budget allows. If you’d like to learn more about Lawrence Central and Rotary in general please attend one of our weekly meetings. We meet at noon on Wednesday’s in the All American Room in the Eldridge Hotel. You can see who the speaker is any given week on our Calendar Page, or email us at lawrencecentralrotary@gmail.com.